In my last guest post, I explained how the fundamentals of a chalet holiday can shape your overall experience and colour the memories you carry away with you. In this concluding part, I will have a look at the smaller details and how they, too, can enhance your journey – making your enjoyment of your winter chalet holiday last not just a week, but a whole lifetime. When you book a chalet holiday, it’s great to have just one point of contact and recognising their voice each time you call can be very reassuring when there is so much to organise. If you’re the party leader, you can often end up handling a lot more than you first realised might be the case, whether it’s taking deposits, clearing balances, ordering ski hire and liftpasses, booking ski lessons, arranging airport transfers to and from Geneva – the list goes on. The good news is that, to an independent chalet company, this is all everyday routine and they will guide you every step of the way. In many cases, the chalet company will act as an agent for all these ski extras, taking all the stress out of it for you. Before you know it, they’ve picked you up from the airport, had your skis delivered to the ski room, brought your liftpass to your chalet, shown you the way to the ski lessons meeting point, and sent you on your way with a few tips of where you’ll find the best skiing. All the extras, none of the stress. Independent chalet companies are generally quite small, often family-run, and even where companies grow larger, the underlying ethos should remain that of a small, family business. If you choose to book a ski chalet holiday, as opposed to a hotel break for example, then you should expect quite a personalised service: you will be speaking to real people who remember your name instead of asking for your booking reference. This has many benefits when it comes to pre- and post-holiday service, as well as during your stay. Small chalet companies rely heavily on guests who rebook, so upsetting a guest is not an option. So an independent chalet company is likely to go much further in helping you before you pay and after you leave than might be the case with a larger corporation. But this is not just hard-nosed business sense at work here. Generally, I find that ‘real’ people like to be nice to other ‘real’ people. And, spending a week with just one or two staff members, you are likely to build a positive connection with them. Chalet work is not well paid and yet it remains a highly competitive job market because of the perks that come with the job: free accommodation in-resort, free liftpass all season, and free time to ski all winter long. For most seasonaires, that’s reward enough. The job attracts young people with dynamic personalities and a lust for life. What this means for you is that, in most cases, you will be well looked after by an intelligent individual with a personality who speaks English to fluent or native standard. In turn, this provides the basis for a good rapport and, if you want to, you can enjoy some bon vivant and some good banter with your chalet host. As you build up a rapport with your chalet host, they will gain satisfaction from seeing you enjoy your chalet holiday in a way which seldom happens in a large hotel with dozens of staff. Having someone who cares enough to help goes a long way if you lose your liftpass or your boots don’t fit. By mid-week, a good chalet host will have looked after you so well that their night off can become a thing to dread, but you should think of this as your big chance to experience the resort itself. Your host will help you to make arrangements for eating out, booking a table if necessary. Independent catered chalets will often list their menus in advance so, to avoid eating the same thing twice, you can make a note of what to skip when ordering at the restaurant. Eating out is a good chance to indulge in some ski resort classics which might not be available at the chalet itself, such as a belt-busting fondue. For dessert, look out for the equally decadent cafe gourmand, a selection of mini-puddings served with a delicious hot coffee. After supper, take a stroll around the resort centre and take in the sights – in a big resort like Meribel there will be plenty of late-night action, while more traditional resorts like Chatel will look even more beautiful with the stars and the village lights setting off the snowscapes below. A holiday is only as good as the company you keep, and there is no better way to spend time with friends and family than in the comfort of a snow-draped ski chalet. Each morning, the group will be buzzing with excitement in anticipation of the day’s skiing. Each afternoon, over coffee and cakes, see how the group comes to life in exchanging stories and recollections of an unforgettable day on the slopes. Finally, at supper, fill your neighbour’s glass with the evening’s choicest wine and let tomorrow’s fondest memories unfold. If yours is a smaller party, don’t be put off. Sharing your chalet with other groups is a great way to make new friends and share new experiences with others. Most modern chalets are large enough to offer privacy and seclusion when you want it but, gathering by the log fire each evening, you’ll be comfortable in any company. This article was authored by Daniel Pressley on behalf of Delicious Mountain Luxury Chalets, Meribel. A catered chalet holiday is a great way to get away with those you love, spending quality time with friends and family in a setting which will stay with you forever. As you travel home at the end of the week, you will carry with you the memories of a holiday which is truly unique. In this two-part post, guest author Daniel Pressley has a look at some of the things which make a chalet holiday so different and so special, highlighting ten aspects of your trip which will keep you coming back year after year. Here are the first five. Ski resorts are all different, so it is important to find the right one for you and your group. Chatel, for example, is the perfect destination for families: quiet and quaint but with plenty to keep the kids occupied, Chatel has retained all of its traditional Savoyard charm. In a picture postcard destination like Chatel, there will be plenty of photo opportunities so keep your camera handy. On ther other hand, if you’re looking for the more expensive luxury chalets Meribel might be the resort for you. A luxury catered chalet in Meribel certainly won’t be the cheapest ski holiday you could find, but you won’t find a much better location if you’re looking to book something extra special this winter. Like Chatel, Meribel offers access to over 600km of marked pistes and has a lift infrastructure which is the envy of ski resorts the world over. So, choosing from resorts like these, you can be assured of a great week’s skiing, whether it’s your first time visiting or your first time graduating to a pensioner’s liftpass. It is also important to note that location does not stop with the resort and ski area. You should give careful consideration to how you are going to access the piste each morning. With the proliferation of luxury chalet holidays in recent years, there is a growing clamour among chalet companies to get closer and closer to the piste itself. The gold standard in this respect is ski-in/ski-out, which allows you to put your skis on at the chalet door and keep them on until your first break for vin chaud. While only a minority of chalets will ever offer this kind of access, it’s always worth thinking ahead and planning your morning routine. If you’re more than a few hundred metres from the slopes, your chalet company should deliver you to the lift but it’s worth checking in advance. A chalet is much more intimate than a hotel and, if you pick the right one for you, your party and your budget, it really can feel like a magical dream home for the week. For some, the chalet is purely functional – somewhere to rest your head for the week, and a place where you know the kids are safe as you unwind in the lounge. For others, the chalet is as much a focal point of the holiday as the skiing itself; for some, even more so. So it’s certainly important to choose the right chalet for you. Many people will look out for those little extra touches that turn a chalet into a luxury chalet, but it’s worth keeping in mind that the spa, the sauna, the hot tub and the extra course for dinner will add up significantly when it comes to paying the bill. Prices for chalet holidays can vary enormously, and it’s important to understand each of the variables in play. While a luxury catered chalet in Meribel will always cost more than a budget break in some of the less expensive resorts, prices can still vary with more like-for-like comparisons. The most obvious consideration is time: when do you want to go skiing. Early or late in the season may be cheapest, but the snow might not be as good as mid-season. If you don’t have kids, avoiding half-term and Easter is a must. A good way to reduce costs, is to go self-catered. 5. Self-catered or Catered Chalets? For many people who book luxury chalet holidays, the chalet catering can become one of the key attractions of the ski vacation overall. One only has to look a catered chalet website to how central the cuisine is to the holiday experience as a whole: soft-focus images of mouth-watering temptations adorn every page, making you not only want to book right now but depart right now. In my experience, chalet catering is very good indeed and is generally made with wholesome regional produce according to recipes which uphold local culinary traditions. You shouldn’t expect to lose weight, but you won’t regret the money you spend on catering if you like French food. Of course, self-catering is also an option and one to be taken seriously. This is especially true if you are more interested in skiing than eating, if you’re trying to stay healthy, or if you’re on a budget. Find out more about luxury chalets in part two. This article was submitted by Delicious Mountain Luxury Chalets, Meribel. New to the rental market for winter 2012/2013, and minutes from the pistes of Linga, Apartment la Tocade is located on the top floor of a beautifully renovated farmhouse originally constructed in 1870. The apartment has been renovated to the highest standard throughout and is beautifully furnished with bespoke, handcrafted interiors, combining traditional alpine materials with modern design and comfort. La Tocade is ideally located, situated opposite the main pistes and lifts at Linga. It is also a short walk to the Piou-Piou nursery, ski hire as well as local amenities. The apartment has a spacious open-plan layout (approx 75m squared ) and will comfortably accommodate 7-8 people. There are two bedrooms, one double, one triple (containing double and single beds) as well as a separate coin montagne with bunk beds. In addition, either bedroom will comfortably accommodate an additional child’s bed or travel cot. The apartment has its own secure ski locker as well as separate locker with private boot warmer on the ground floor. The apartment also boasts a generous covered private balcony with views overlooking the pistes at Linga on one side and the beautiful Chatel valley on the other. Apartment facilities include fully equipped kitchen, dishwasher, washing machine, free wi-fi, Wii console, DVD player (plus selection of DVDs), IPod docking station, hair dryer. There is private parking for 2 vehicles. Complimentary linen, towels and luxury toiletries are included for all guests. Ski hire, lift passes and ski lessons can be arranged for guests in advance of arrival. La Tocade is available to rent on a self-catered basis throughout the year. Rental prices start from £750 per week. It seems only right that good food should be at the heart of a well-earned holiday in France – with its peerless tradition in gastronomy and amazing regional produce. So it’s perhaps not surprising that catering has become such a mainstay of the chalet holiday experience. You only have to spend a few short minutes visiting chalet holiday websites to see how integral the catering is to the holiday overall, with enticing images of mouth-watering cuisine featuring no less prominently than the skiing itself. The advantages of staying in a catered chalet are fairly obvious. After a long day on the slopes, it’s an industrious soul indeed who volunteers to cook for the group as a whole, and many would be tempted by the more expensive and less easily-budgeted option of dining out each night. Although perhaps not quite as accurately as a leave-your-wallet-at-home all-inclusive break, a catered chalet holiday allows you to gauge the total cost of your trip by paying for your meals outright. Especially with a family or large group, this can make budgeting much easier. No less importantly, staying in a catered chalet can allow you to relax without having to worry about booking a table for a large group, getting the kids home at a sensible time, or leaving the warming welcoming glow of the chalet’s log fire. Which meals are provided and when? Chalet catering usually covers breakfast and evening meals, six days out of seven. One day per week, the chalet host generally has a day off and guests are encouraged to dine out, so bear this in mind when you’re budgeting. Lunches are generally not provided as guests would normally be out skiing, but some chalet hosts will provide packed lunches – ask your chalet company if you’re unsure. As you return from the slopes each afternoon, coffee and cakes will welcome you back to the chalet. This is a really nice touch which is standard in almost all catered chalets. Provision of alcoholic beverages varies from chalet to chalet, with many offering wine and beer during the evening meal, while some even keep a stocked fridge from which guests can simply help themselves. Details will often be given online, on the chalet company’s website or holiday advertisement, but again you might like to check in advance. Most chalet companies will accommodate special dietary requirements, including vegetarian and vegan options, dairy-/lactose-free alternatives, gluten-free, wheat-free, low salt, diabetic, halal and kosher. It’s worth noting, of course, that you know more about your dietary needs than any chef does – so don’t be afraid to share that knowledge. Can I hire caterers for my self-catered chalet? This is an increasingly popular option for skiers who have booked a self-catering chalet but do not wish to cook for themselves. It might be that you couldn’t get a catered chalet, or might be that you have just skied too long and hard to face the trip to the supermarket. Whatever the reason, chalet chefs are available for hire and will come to your chalet each morning and evening to prepare meals for you. This article was submitted by The Chalet Experience, a ski holiday website specialising in catered chalets in France. Well it’s been a very exciting race, I managed to watch every stage of the 2012 Tour de France and I have enjoyed it loads. 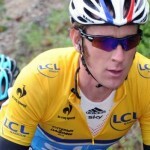 Bradley and Team Sky did a great job throughout the Tour and made winning look easy. Not only was this a great win for Bradley, but this was the first time a British Rider has one the Tour De France, I have to admit being of Italian blood I was following Vincenzo Nibali but having cooked for Team Sky a month ago I felt a certain connection with them and was very pleased when Team Sky ended up with 1st and 2nd place. It looks like Team Sky Boss Dave Brailsford has commented on Mark Cavendish saying if he wants to leave SKY he can, I get the impression Team Sky would like to concentrate on the GC and that might not be what Cavendish wants. 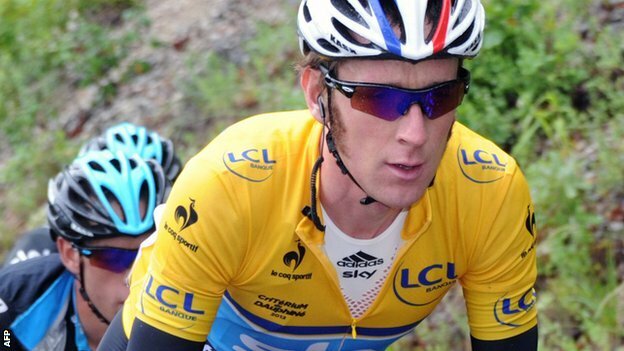 It will be also interesting to see what Chris Froome decides to do, I am sure he is desperate to compete for the title next year but I don’t think Bradley Wiggins will want that, I can see Bradley Wiggins wanting to try and win more Tours. We will just have to see how that one goes, but now I suppose the riders have to concentrate on the Olympics next week. 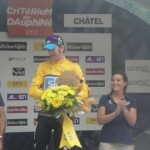 Bradley Wiggins wins the Criterium de Dauphine in Chatel. It was a very well deserved win and looked the favorite from the start of the race. Myself and the family made it up to Chatel to watch the riders come over the finish line , there was a great turn out and Chatel village looked the part. 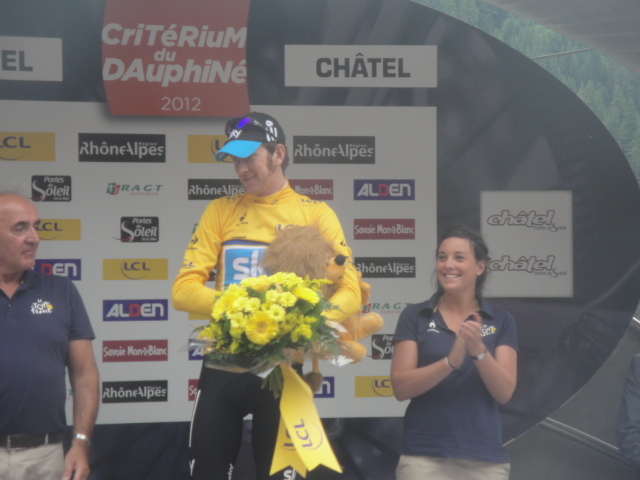 I was very lucky to be cooking that night for team Sky, and it was all made better by Bradley winning the Dauphine. I would say that he is looking good for the Tour de France in July, he has a strong team behind him. It was a great experience meeting the riders and having a drink after dinner with them. We hope that Team Sky go all the way in the Tour de France! 2nd out 860 chalets on Trip advisor! Just to give you an update, we are now ranked 2 nd out of 860 chalets. We would like to thank all our clients for adding reviews on Trip Advisor. Each year continues to get better with more clients returning to the chalet. Please if you are looking to book get in there early. Ps A big tahnk you to my staff and all those connected with Alpine Connection! It’s been 1 year since I have asked clients to leave a review on Trip Advisor and in that year we have found ourselves 5th out of 708 chalets. Also this week we were awarded with a Certificate of excellence. From this result you can tell that at Chalet Rustique we try to offer the best service where possible. Its hard work, but myself and the team at Alpine -Connection get a great buzz that clients have had an amazing time with us. For those looking at booking your next ski holiday, you should take Trip advisor into consideration as its now more important than a grading that is given by the tourist office, guide book etc… So remember when booking your next ski holiday look at our reviews , and who knows we may be looking after you. Zoe Gillings, Britain’s No 1 Olympic Snow sports athlete put in two excellent performances in Gressoney, Italy, this weekend at the Italian SBX Federation Internationale de Ski (FIS) Snowboard cross races clinching two back to back victories on consecutive days. This result is all the more impressive as Zoe has had a troubled season with regard to finances and she is still recovering from an injury sustained at the Olympics back in February which has culminated in absolutely minimal on snow training time in the last 12 months. Zoe made an impressive start to Saturdays competition qualifying in 1st place, over half a second in front of her closest rival. Zoe then went on to dominate the heats putting in some strong technical racing and beating her opponents convincingly to take gold. Zoe then went into Sundays competition full of confidence from the previous day. She again put down the fastest qualification time but faced stiffer competition in the heats being passed into second place at the first corner of the final heat. Zoe quickly fought back passing back into 1st place where she remained for the rest of the race. The FIS competition is a lower level of competition to world cup but saw 28 athletes on day one and 19 athletes on day two competing from nations across Europe. Zoe recent highlights have been 8th place at the Winter Olympics, 3rd place at the French FIS race in Puy St Vincent, 7th at the World Championships in Spain and two victories here in Italy at the weekend yet due to the politics involved in British sport Zoe’s entire funding is ending at the end of March. Gillings takes 3rd place in French snowboard cross cup! Following 10 months of rehabilitation since the Winter Olympics back in February in Vancouver on her left knee and after UK Sport’s decision to end all World class funding of Snowboarding in the UK, Zoe Gillings returned to competition at the weekend with a 3rd place finish on Sunday in the Federation Internationale de Ski (FIS) French Snowboard cross Cup beating Olympic Silver medallist Deborah Anthonioz, re-affirming her position as Britain’s No 1 Olympic snow sports athlete. What makes this result stand out is that Zoe still hasn’t received the £31,000 of funding covering 1st October 2010 until the 31st March 2011 and she has had to fund the World Cup SBX program herself with minimal personal finances. This funding is now nearly 3 ½ months overdue and its now over half way through the funding period. Unfortunately Zoe doesn’t have the available finances to run the program herself and as such she hasn’t had any coaching since the Olympics. During this time Zoe has also undergone key hole surgery to her knee to plug the cartilage she damaged during the Olympics. She has undergone a long and painful summer of rehabilitation with zero time training with her coach. Despite this competition being a lower standard to World Cup, it attracted more than double the amount of athletes Zoe is used to including Olympic gold medallist Maelle Ricker, Olympic Silver medallist Deborah Anthonioz and several other World Cup athletes. What makes this result even more remarkable for Zoe is that she beat the Olympic Silver medallist by over 1.5 seconds and finished immediately behind the Olympic Gold medallist – Ricker – who finished in 2nd place.